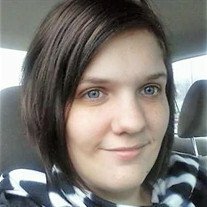 Alisha Jo (Jennen) Huggins, 28, of Russellville, died Saturday, September 1, 2018, at her residence. The daughter of Samuel and Debra Kay (Jennen) Hughes, she was born September 23, 1989, in Russellville. She was a 2008 graduate of Russellville High School and attended beauty college. She was married to Christopher Alan Huggins, and worked at Arkansas Building Services & Facility Solutions of Russellville. Alisha was preceded in death by her son, Landon Alan Huggins; a brother, Eric Lee Hughes; a great grandfather, Don Baldwin; and a great grandmother, Alice Baldwin. She is survived by her husband; two daughters, Anna Huggins and Abigail Huggins, both of Russellville; a son, Owen Huggins of Russellville; a sister, Kaytlin Jennen; a brother, Kristopher Jennen; her mother, Debra Jennen; her dad, David Hughes, both of Russellville; her father, Rick Jennen of Russellville; her granddad, John Jennen; and her grandmother, Joanne Mack of Morrilton. A memorial service will be held at 10:00AM, Thursday, September 6, at The Journey Church, 3001 East "H" Street, in Russellville, under the direction of Humphrey Funeral Service. Rev. Shane Chancellor will officiate. The family will receive friends from 6:00 to 8:00PM on Wednesday night in the funeral home chapel. Cremation arrangements are under the direction of Humphrey Funeral Service. Internet obituary and online guest book are available at www.humphreyfuneral.com.